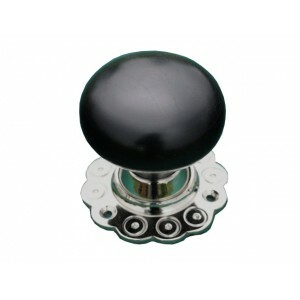 Reproduced from a very pretty original, this stunning solid ebony* wooden bun knob has two loose roses making it suitable for both rim and mortice locks. The nickel collar reinforces the wood and the nickel flower roses compliment the design. Threaded spindles allow adjustment to different door thicknesses with a grub screw. 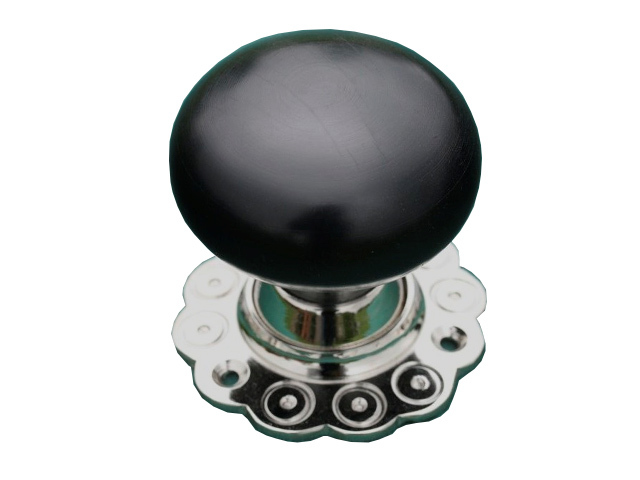 Measures: Rose Diameter: 60mm, Knob Diameter: 55mm, Height: 62mm. Approx. Spindle length approx 110mm - Please check carefully that this will accommodate your door thickness, longer spindles may be available, please contact us with your requirements. *Ebony used has been ethically sourced and verified by Kew Gardens.